For the last two weeks, the PFI staff, board, and broader team have been driving hard to finalize all of the many details that make up our annual conference. The agenda has evolved in a number of important ways and I hope you'll take a minute to review the schedule as it stands now. I'm happy to report that the key conversations we were hoping to have at the conference are scheduled and populated with speakers I'm looking forward to speaking with. Most recently, we've added a conversation about the PFI Standards Program and what the future holds for the program, its participants and PFI. Without a doubt, this is the issue that generates the most passionate discussion within our organization. I'm pleased to let you know that we've put together a panel that gives the varied positions on the program equal billing which I think is vitally important. I expect a lively debate, but I think it is crucial as we move forward as an organization to decide how and where the standards program fits into what we do. I'm really looking forward to our time together at the PFI Conference to ask these and other important questions of our members and our affiliated retail partners. Last week I caught up with John Crouch and asked him to preview a couple of the questions I intend to ask while we are together in Myrtle Beach. I've included his answers below. TP: Are we maximizing programs like Stove Swap Outs and state level tax credits to the best of our abilities? What should PFI's role be in amplifying those programs and opportunities for consumers? JC: Woodstove Change Out programs can be a great leveraging opportunity, but they can also be a challenge for PFI. They are unpredictable and localized. Having said that, they are also programs where consumers, who have a history with an old woodstove, are drawn into stores with a subsidy of anywhere from $500 to $1500, and invited to buy, anything that is cleaner than their old stove. Change outs are not only an opportunity to sell appliances but are also a promotional focus, which may influence the overall positive perception of the category in that region. There have been change-out programs where PFI members kicked in promotional discounts, that have dried up, ironically, just as the change-outs got bigger. Right now the biggest change-out doesn't include pellet stoves, and that has to be addressed. TP: What is the best argument for wood pellet heat with consumers today? JC: I'm not sure about the 'best' argument, but certainly we need to move beyond, 'cheapest home heating'. I think some candidates to replace that argument would be the energy security component or an alternative heat source at a consumer's home or stressing the long-term price stability pellets have demonstrated. Additionally, we really need to be talking more about the renewable and zero-net carbon properties of wood pellets with millennials, the next generation of homebuyers in this country. Only TWO Weeks Till the PFI Annual Conference in Myrtle Beach! ! We are excited to see you in Myrtle Beach in only two weeks (June 24-26)! Hotel rooms are almost full so book today if you haven't already. We're building a collection of photos of our members, their pellets mills and product. Send them to Carrie Annand at [email protected]. This week's featured photo is thanks to Lori Hamer of Hamer Pellet. It's just about time for BBQ season regardless of where you happen to be in North America, which means grilling time, too. The Z Grills Elite 900 is a new smoker/BBQ/general purpose cooker option that combines a lot of versatility into a relatively compact package, without requiring the kind of special attention and handholding that you often get with real wood smoker options. 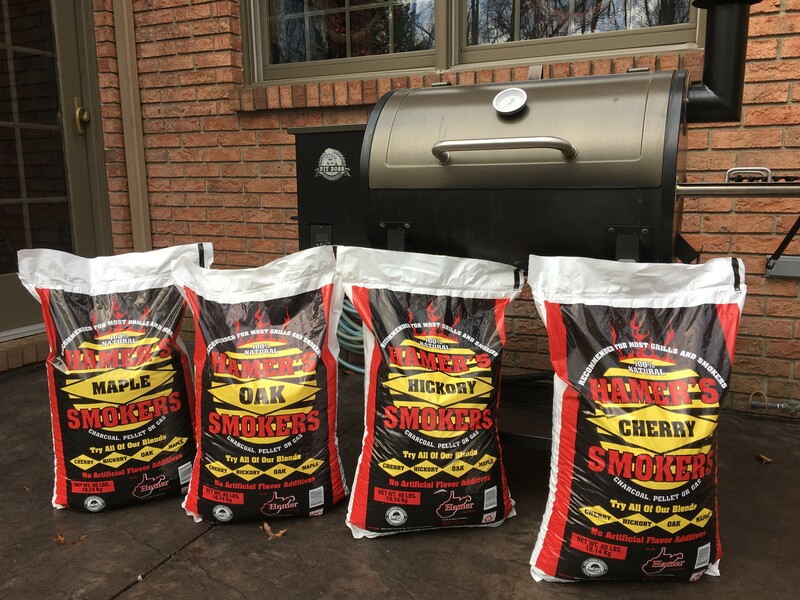 This lets it achieve both consistent and reliable convection-based heat, as well as generate smoke from a range of different wood pellet types of fuel, which means you can get a lot of different flavors depending on what you're cooking. These come out relatively subtle, in my testing, which is great, because often what happens with other styles of cookers like this is that the smoke flavor becomes overwhelming, no matter how easy you try to go. The home of the future could slash your utility bills and generate enough money to help pay the mortgage. UK firm Koru Architects designed and built one such house, named the Lloyd House, that's effectively zero-carbon and runs entirely on renewable energy. Tucked away on a quiet street in England's East Sussex, this contemporary home generates more energy than it consumes and even brings in a net income of £2650 per year from solar photovoltaics, solar thermal, and a wood-chip biomass boiler. he U.S. Energy Information Administration recently released data showing that U.S. manufacturers produced approximately 570,000 tons of densified biomass fuel in February, with sales reaching 640,000 tons during the month. The data was released as part of the May edition of EIA's Monthly Densified Biomass Fuel Report, which includes data for February. The EIA collected data from 87 operating manufacturers of densified biomass fuel to complete the report. The report does not include data from facilities with capacities of less than 10,000 tons per year, which report data annually rather than monthly. The 87 manufacturers that submitted data in February reported have a combined annual production capacity of 11.79 million tons and collectively had an equivalent of 1,964 full-time employees.